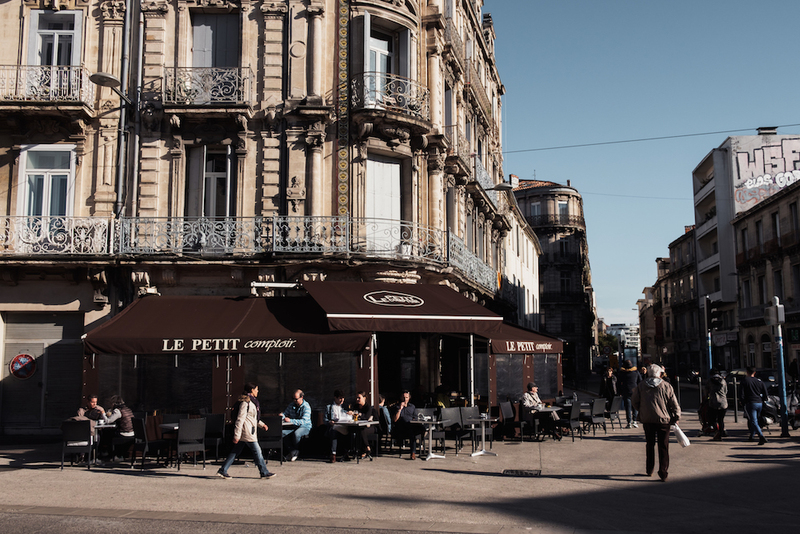 And because it’s such a compact and walkable city, you can enjoy the best of Montpellier in just a day or two. 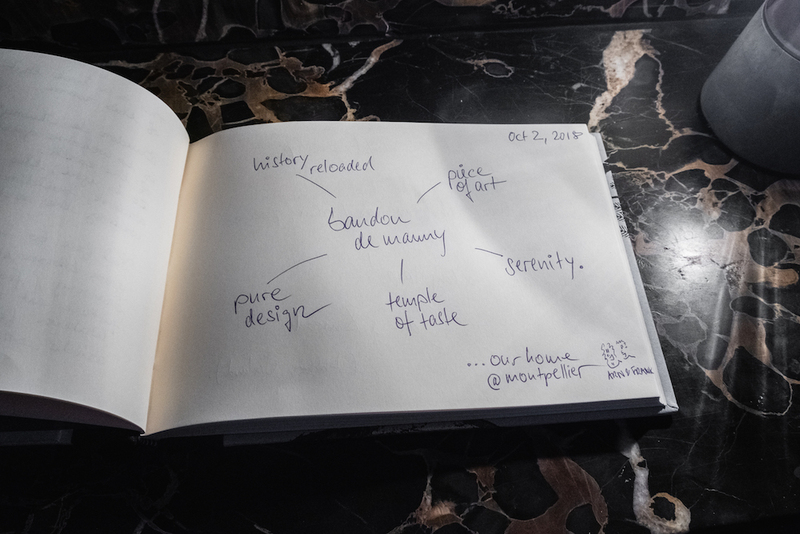 All words & photos by your flâneur of a guide, Ben Holbrook. 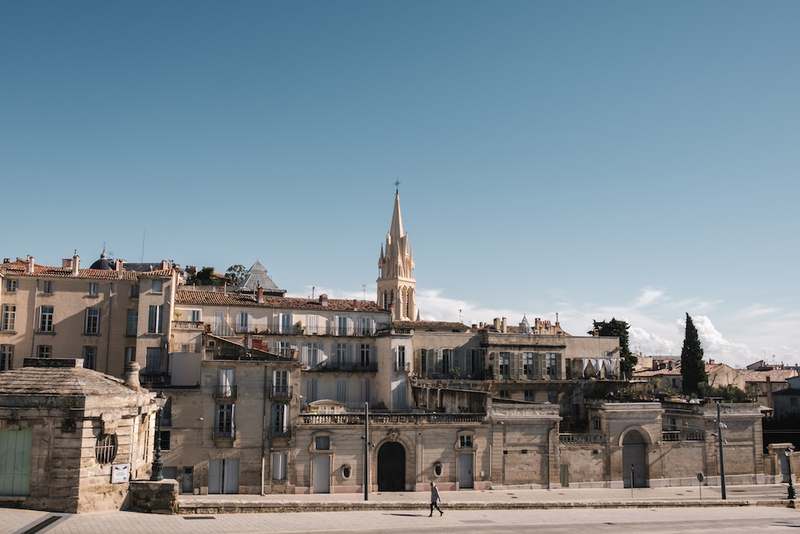 Montpellier oozes with that old world charm that characterises the provincial towns and villages in this idyllic part of the world, that charm that makes you want to sell everything you own and move to France. 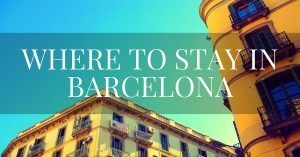 The city’s roots date back to the 10th century and the historic ‘Écusson’ (old town) is a labyrinth of well-worn sandstone buildings, of sun-bleached-mint window shutters and leafy little nooks filled with pretty café terraces. 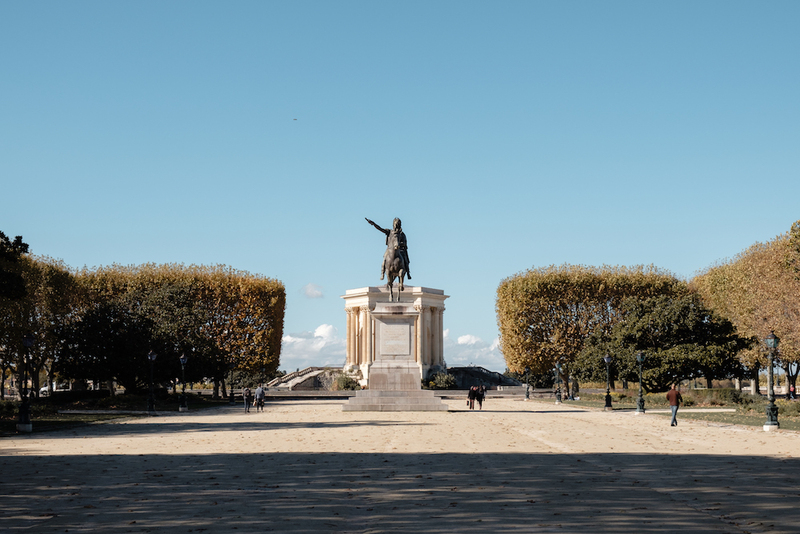 In many ways Montpellier offers all the joys of Paris – the art, the food and wine, the architecture and light – but in a much more smaller, more maanageageable and affordable package. 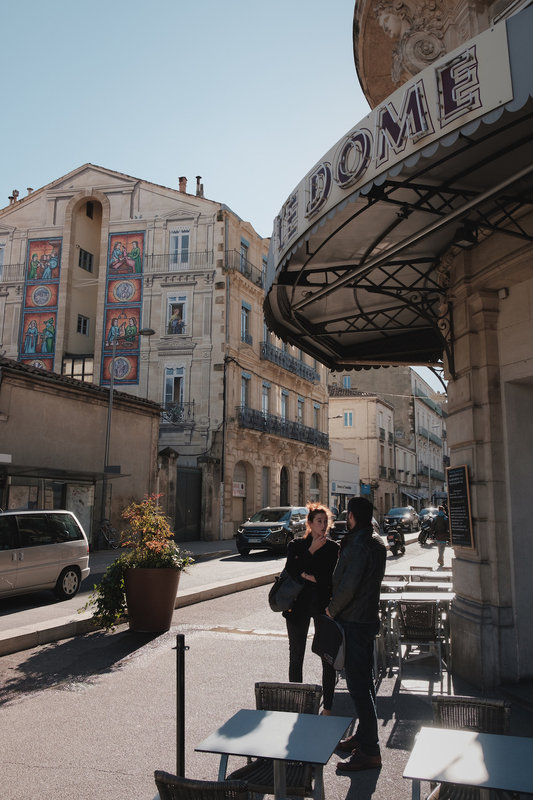 Despite its traditional and somewhat regal veneer, Montpellier’s character is underpinned by defiant and artsy edge, an almost theatrical, circus-like eccentricity. 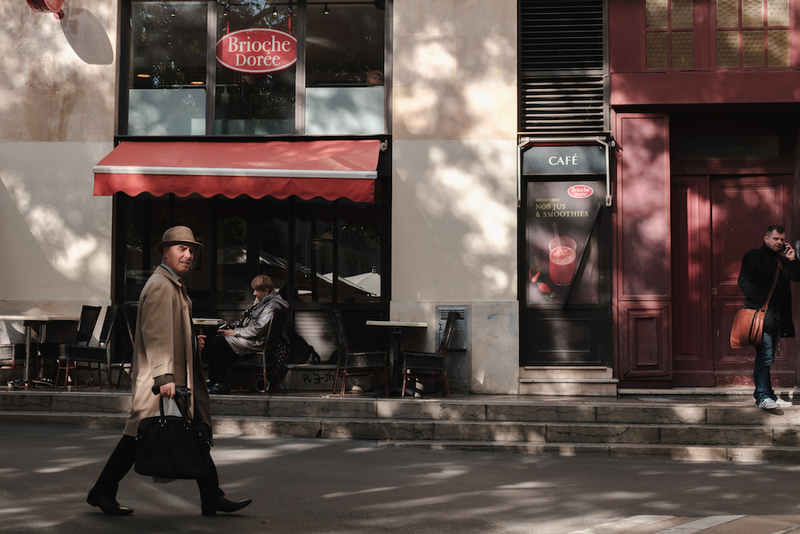 On our first outing, for example, while studying the locals as I tend to do, I noticed a professorial-looking gentleman dressed in beige corduroy trousers and a smart blazer – a fresh baguette wedged under his arm. But this perfectly clichéd scene was thrown off kilter by the fact he was wearing a pair of bright purple Dr. Martens (the ankle-high military boot type). 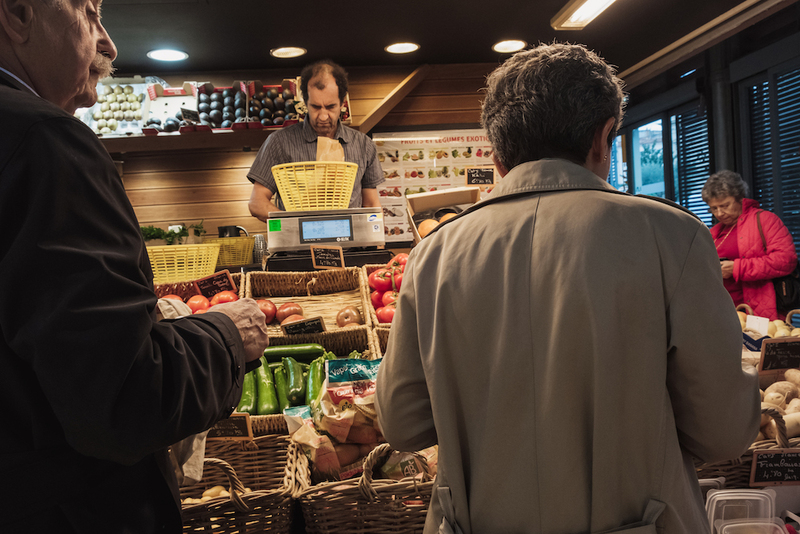 In a supermarket we were served by an elderly lady with candy-apple-red hair, matching dress, nails, lipstick and a pair of over-sized flower power glasses with – you guessed it – electric red lenses. She was, I also deduced, responsible for the psychedelic rock soundtrack that was causing the aisles to rattle. And among the seemingly endless array of brasseries, cafés, cocktail bars, bistros, bouchons and shoe shops, you will also find quirky little record stores, tattoo parlours, body piercing studios and antique toy shops. Nothing in Montpellier is ever quite as straightforward as it may at first appear. 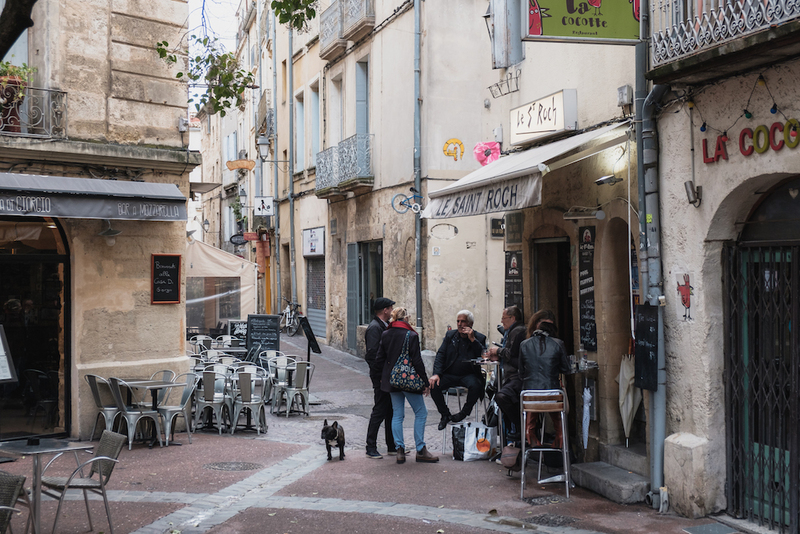 The most likely cause of Montpellier’s youthful vibe is the 50,000 (some sources say 80,000) students who call Montpellier home and account for a third of the city’s total population. There are three universities here, the most famous being the medical faculty, which was founded in the 12th century and survives as the world’s oldest medical school still in operation. Montpellier is also geographically interesting, an obvious base for those who want to explore the many gems of southern France. 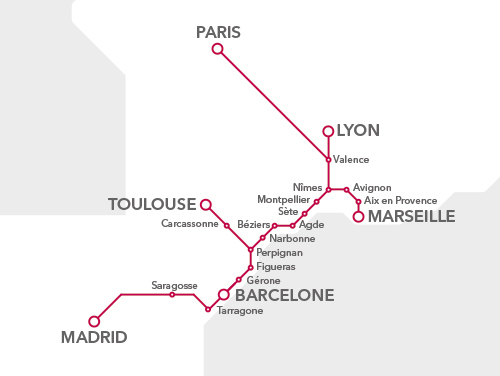 You can hop on the high-speed RENFE SNCF train to famous French towns like Séte, Narbonne, Avignon, Marseille and Aix en Provence in no time at all, or even get to Barcelona in less than 3 hours. 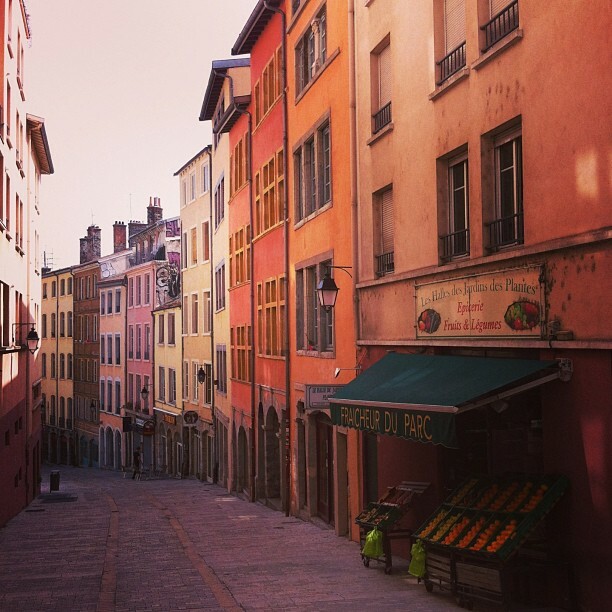 As with any French town or city, my main recommendation is simply to put your flâneur skills to good use. To amble the along the esplanade, to park yourself on a café terrace and watch the world go by. 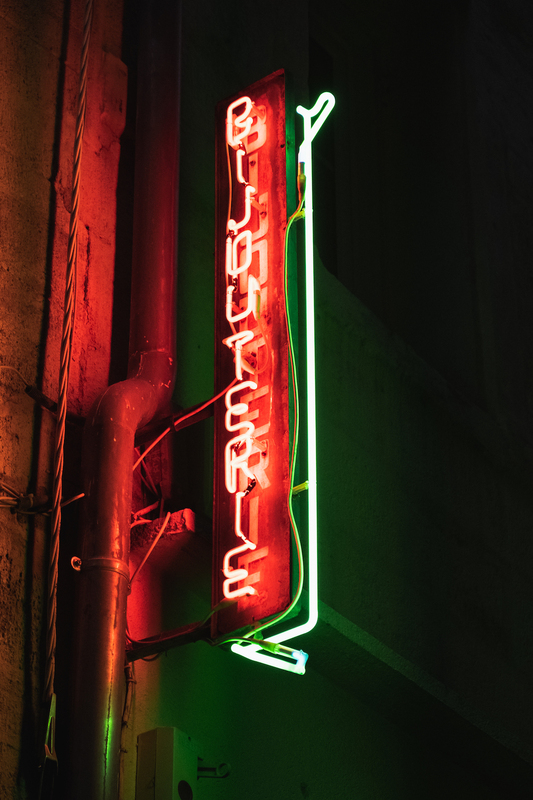 To dine wherever you stumble across crowds (you will definitely spot this in Montpellier). 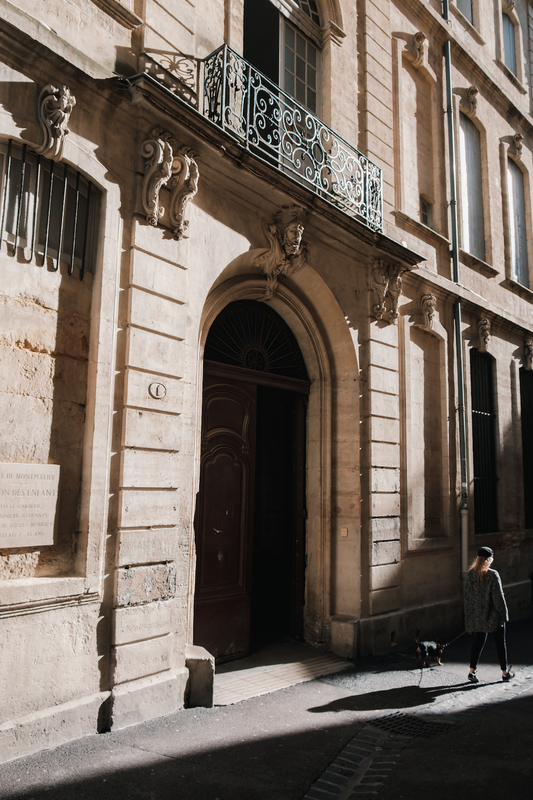 But if you’d like a little more direction, read on to see my recommended things to do in Montpellier, based on our whirlwind two-day visit towards the end of last summer. I’m not much of a morning person, but there’s something about waking up knowing that French pastries and black coffee are only moments away that helps me out of bed. 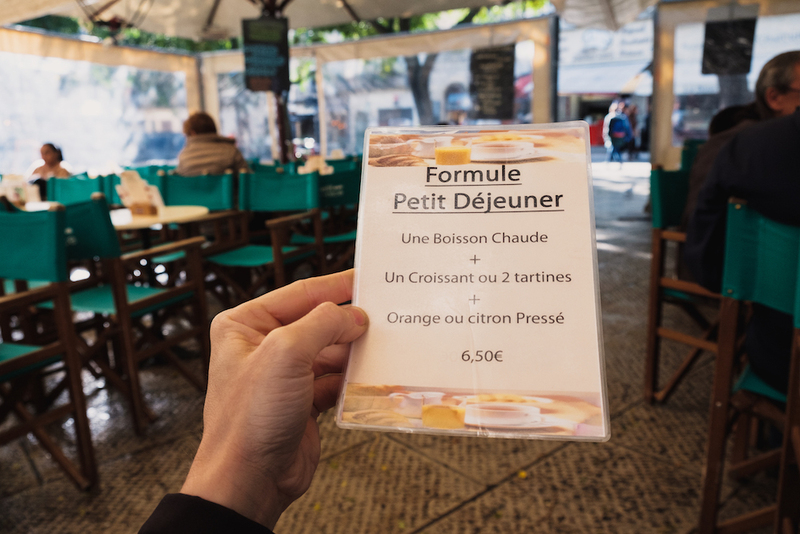 As you’d be right to imagine, you can find good coffee and pastries at countless cafés and boulangeries (bakeries) in Montpellier, but we loved starting the day at Le Petite Nice Café in the leafy square of Place Jean Jaurès (also a great place for your evening aperitif). 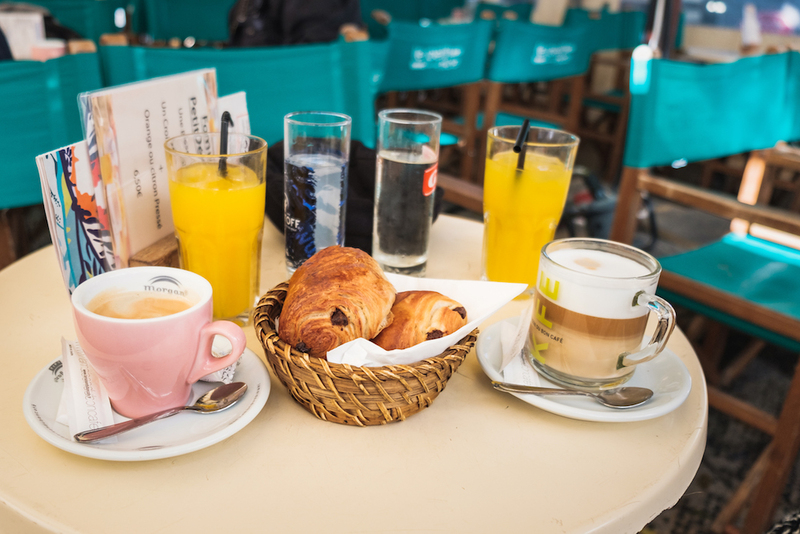 They offer a great little breakfast menu with pastries (croissants or pan au chocolat), orange juice and coffee for €6.50, but more to the point it’s a great place to people watch. 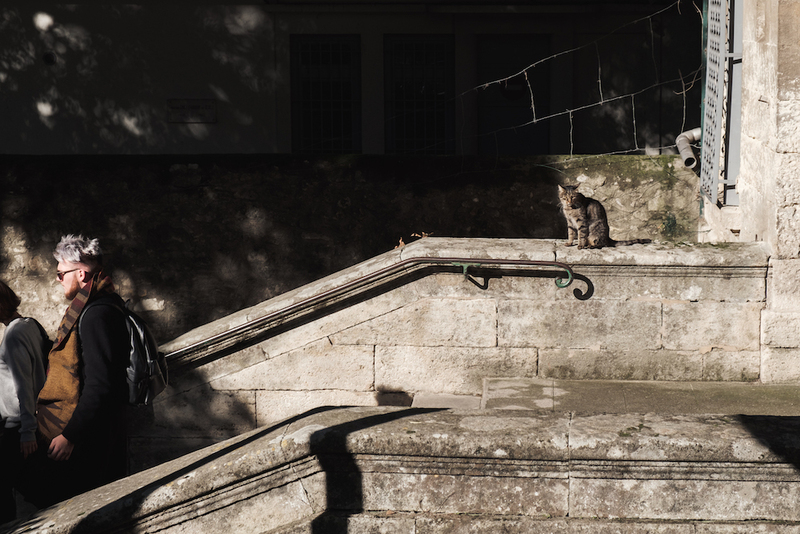 It’s the kind of place where locals gather to shoot the breeze with friends, or enjoy a moment of solitude and read the newspaper. Whether you eat breakfast here or elsewhere (Brioche Dorée next door is a great spot too) is besides the point. The main thing is to get out there and be part of the city as it comes alive, rather than in your hotel. Placa Comédie is Montpellier’s main square and most emblematic landmark, the city’s ‘pièce de resistance’. But it’s not really a square at all. In fact, the locals affectionately refer to it as l’Oeuf (the Egg), owing to its unusual oval layout. At its centre lies the city’s emblematic Three Graces sculpture and fountain, created by Étienne d’Antoine back in 1790. 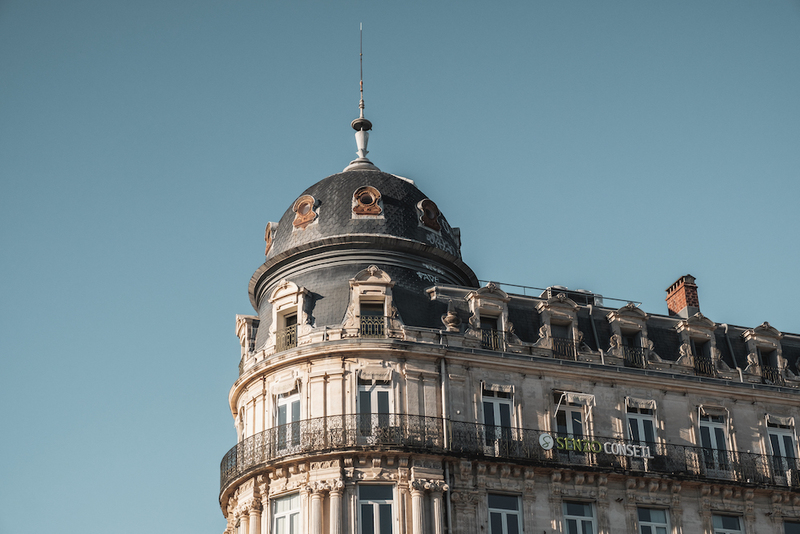 Place de la Comédie plays an important role in local life, acting as a central meeting point and gateway to the city (the train station is just a quick stroll away). 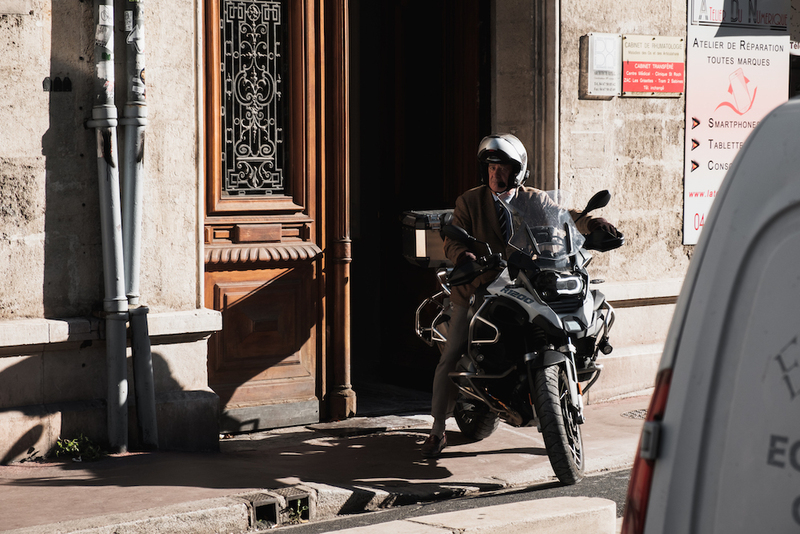 Stop for an over-priced coffee at the historic Café Riche, have a peak inside 18th century L’Opera Comedie theatre, which the square is named after, and be sure to take a few snaps of the many grandiose buildings that fringe the square. Jutting off Place de la Comédie, the Esplanade Charles de Gaulle is a leafy promenade that cuts through the blossoming Jardins de l’Esplanade. 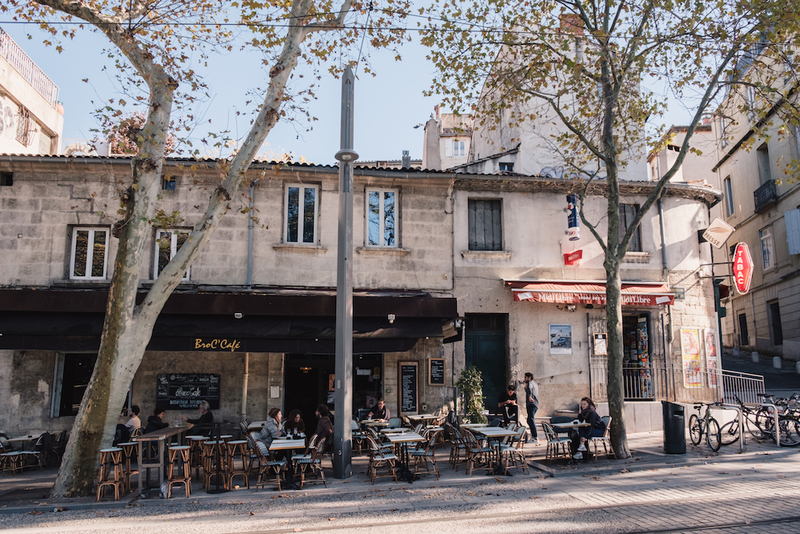 It’s peppered with pretty little outdoor cafés and bandstands and is exactly where you want to be on a sunny day in Montpellier. 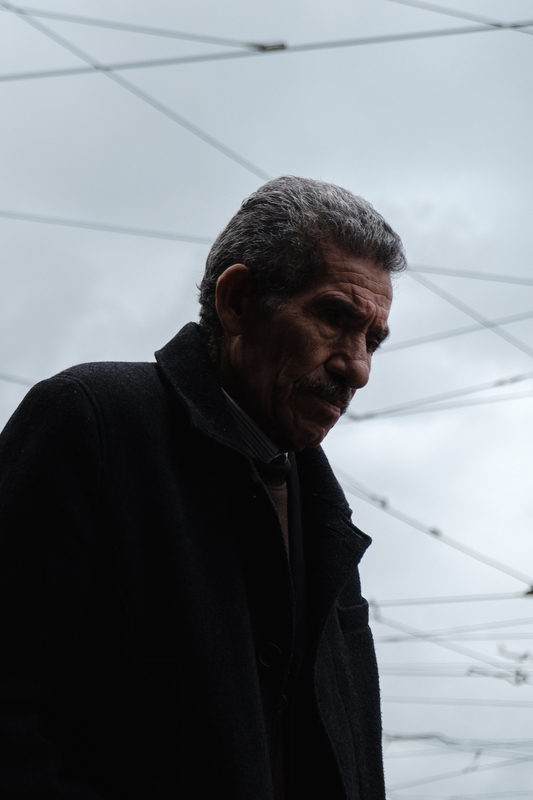 Take a stroll, stop to smell the roses, sip a glass of vin at Café de l’Esplanade or swing by the Pavillon Populaire to see a photography exhibition. This is exactly the joie de vivre (joy of living) you are hoping to find. If there’s one cultural centre you must visit in Montpellier, it’s the Musée Fabre. 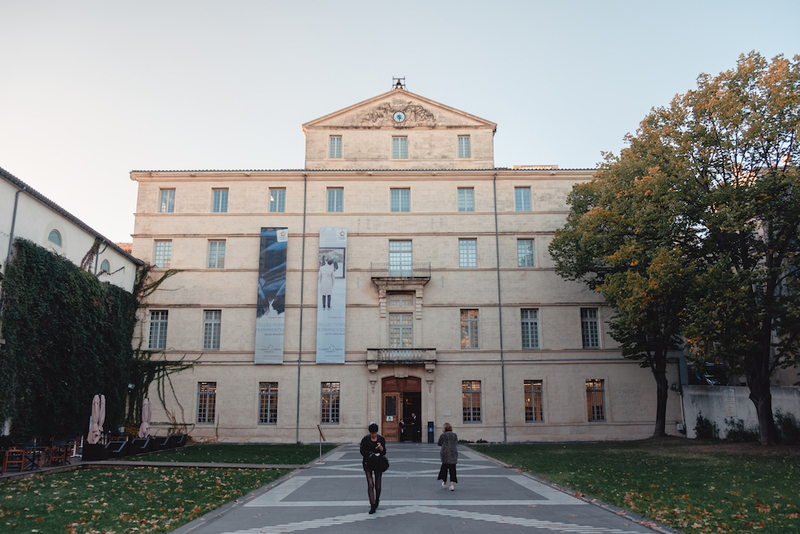 Tucked away just off the Esplanade, near Place de la Comédie, this important art museum harbours one of the most respected collections of French art in the country. 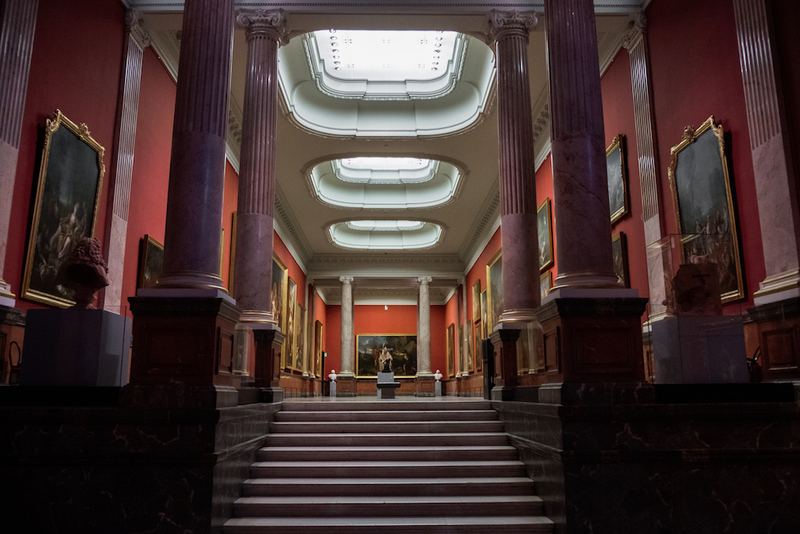 Be warned that this is by no means a small museum and you’ll want plenty of time and energy to make the most of your visit. Tip: The Fabre Museum is free to visit on the first Sunday of every month (normally around €8-10 depending when you go). 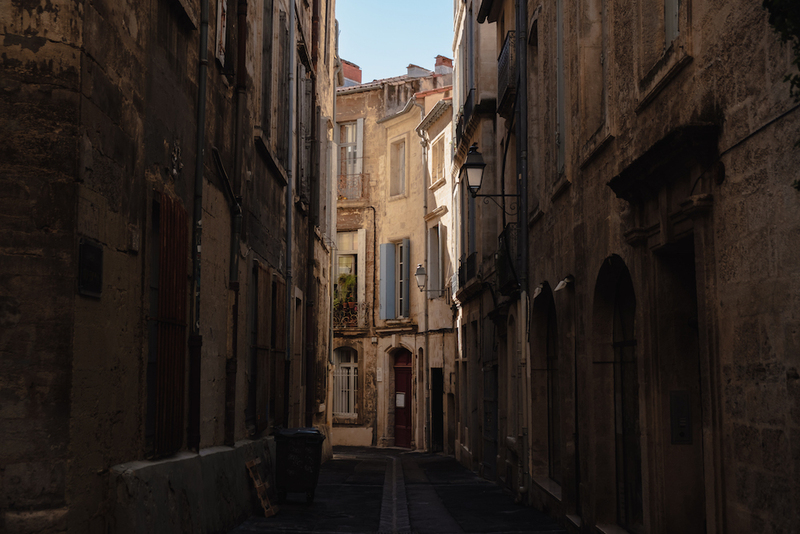 Montpellier’s old town is a beautiful tangle of narrow streets and alleyways, all of which appear to lead to secluded squares or wide open boulevards. It’s the kind of place you can happily spend hours, days and even weeks wandering and getting lost, but also the kind of place where you always seem to end up at a familiar landmark (again). 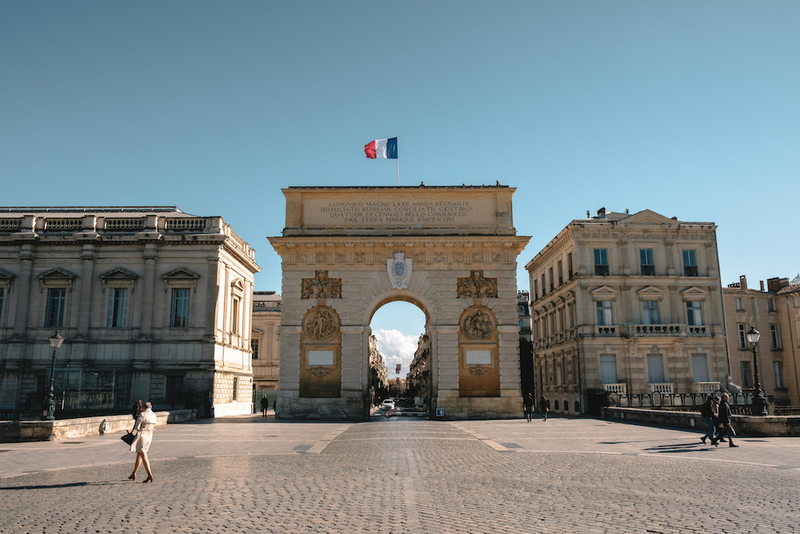 Dedicated to King Louis XIV of France, aka the ‘Sun King’, the Porte du Peyrou (Arc de Triomphe) is Montpellier’s most iconic landmark. Dating back to 1690, it was designed by French architect François d’Orbay, who was also responsible for Le Louvre and Versailles in Paris. If you have time (and energy), you can climb the 100 steps to the top of the monument and enjoy what many say are the best views of Montpellier. 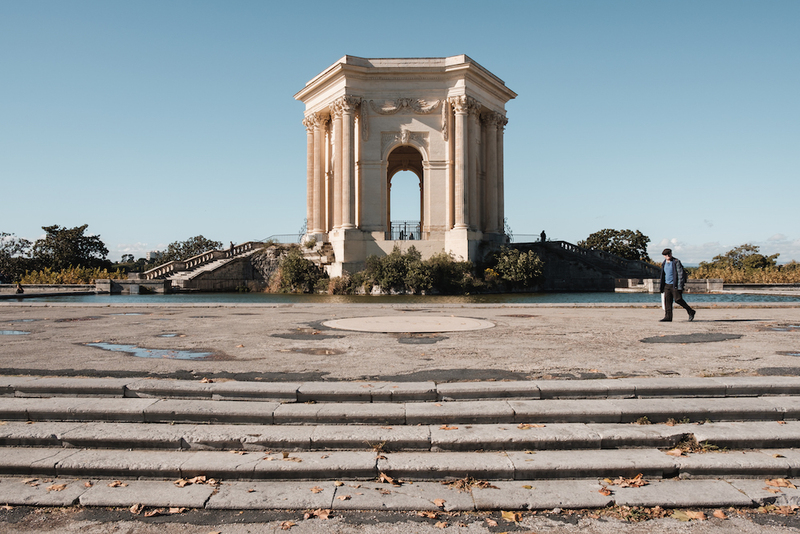 Montpellier’s Arc de Triomphe may be the gateway to the city, but it’s also the gateway to the romantic Promenade Royale du Peyrou. It was here, as Rosana walked our little dog, Café, along the the leafy esplanade, that we started talking about how we would like to live in Montpellier one day. 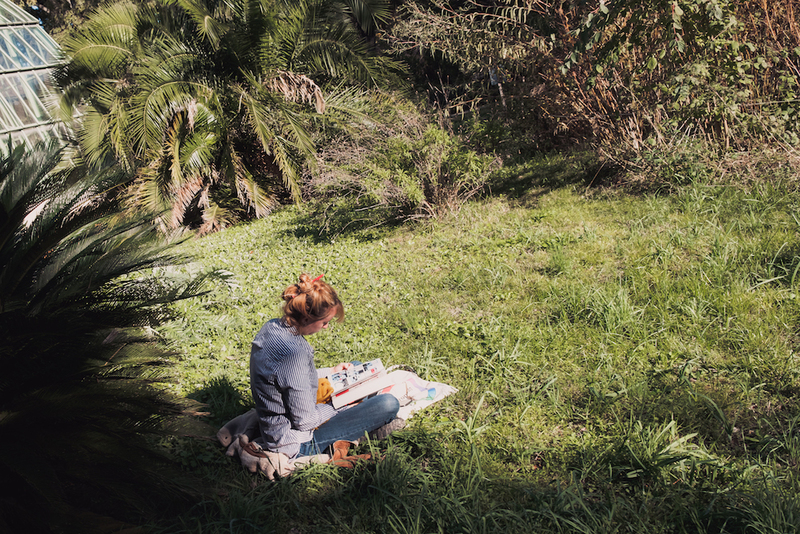 Students stretched on the benches and verdant lawns, some leafing through books, others partaking in less academic activities. At the end of the promenade is the Château d’Eau, an old water tower that provides sweeping views over a gorgeous Roman aqueduct. Apparently, on a good day you can see the Mediterranean from here. 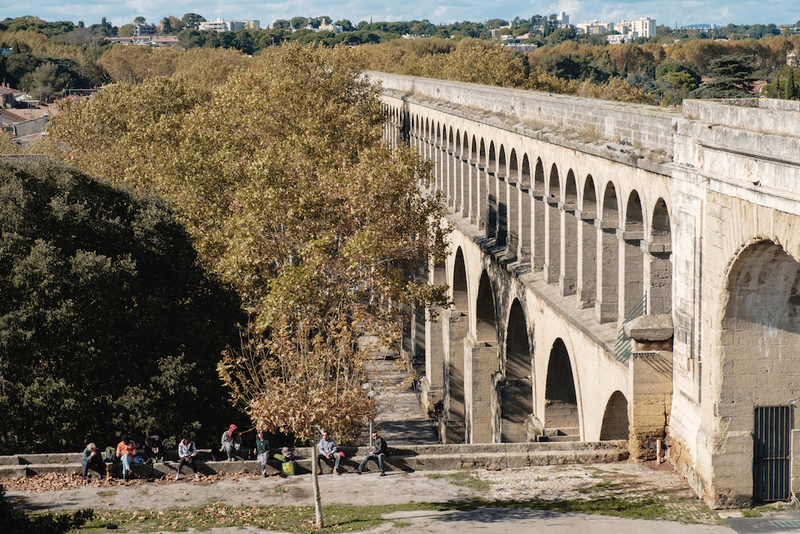 Tip: Every Sunday, the Marché des Arceaux (street market) is held under the arches of the aqueduct and is said to be one of the finest in France. 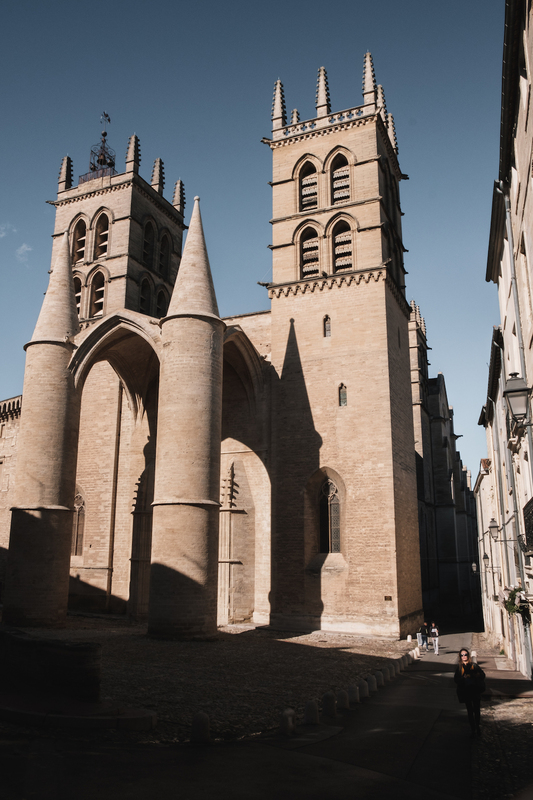 Dating back to 1364, Montpellier’s iconic cathedral is a colossal Gothic structure that looks more like a castle (and a fairytale one at that) than a cathedral. The two towers that adorn the main entrance pierce the sky and are visible from almost anywhere in Montpellier. Entry is free and guided tours are also available. 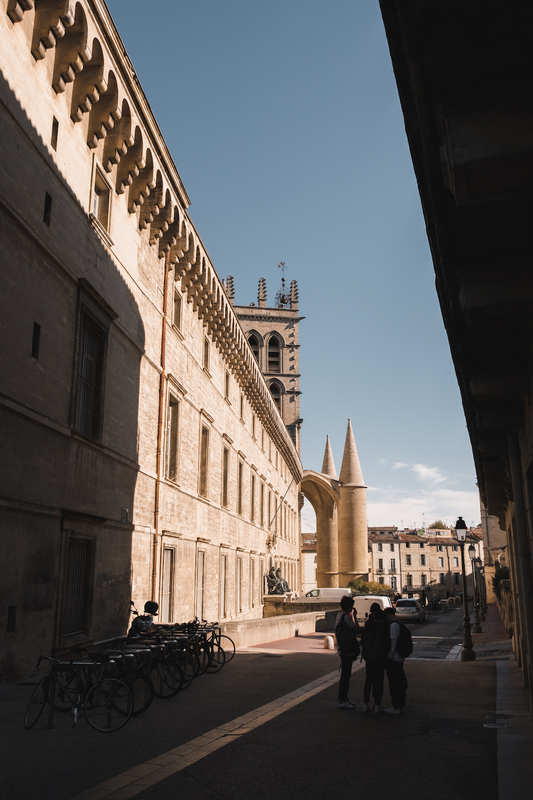 Housed within the walls of an old Benedictine monastery and physically joined to the cathedral, the University of Montpellier’s Faculty of Medicine is the oldest in Europe. The inner courtyard is well worth a visit, as is the fascinating Musée d’Anatomie, and definitely consider taking a guided tour if you have time. Founded by Henry IV in 1593, Montpellier’s Jardin des Plantes (botanical gardens) are the oldest in France and the second oldest in Europe. Here you will find couples stroll hand-in-hand among the 2,680 different plant species, from the orangery to the English garden, and bookworms indulge in a little tranquility in the shade the tropical palms. 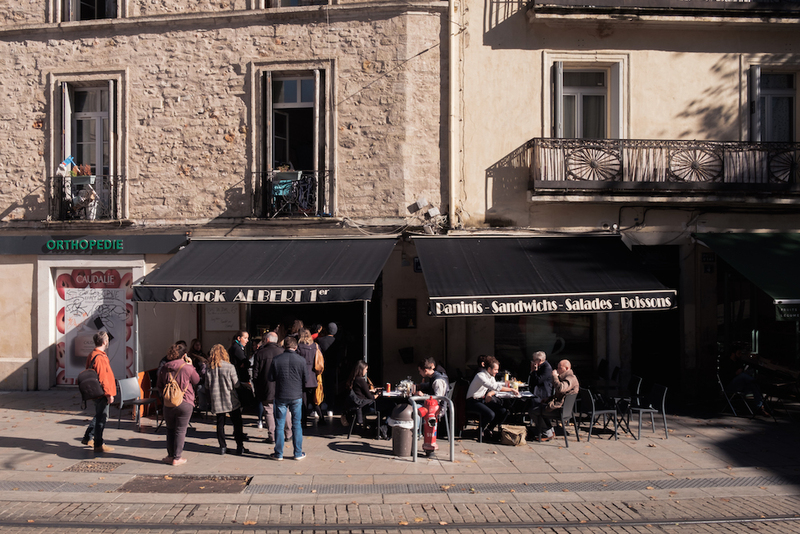 Tip: Within stumbling distance of the gardens is the popular Broc Café, a fantastic place to stop for an aperitif before lunch (or lunch itself). Once described by an architect in 1688 as being, “less beautiful than palaces, but more beautiful than simple lodgings,” France’s hôtels particuliers were grand properties built for wealthy families as second homes in the city. They’re not to be confused as hotels, although luckily for us travellers many of them have been converted. The properties typically boast large courtyards, “because the streets were a disaster at this time,” allowing owners to ride their carriages directly into their homes without ever having to step foot in the filthy streets outside. For this reason, the courtyards and interior staircases are often far more ostentatious than the facades themselves. Hôtel de Varennes – An imposing medieval property that now houses the Musée du Vieux Montpellier. Hôtel des Trésoriers de France – Famous for being the residence of King Louis XIII in 1632. Hotel des Trésoriers de la Bourse / Maison de Heidelberg – Now houses the German Cultural Centre. Hôtel St-Côme – An impressive structure that features an amphitheater designed for holding anatomy demonstrations. 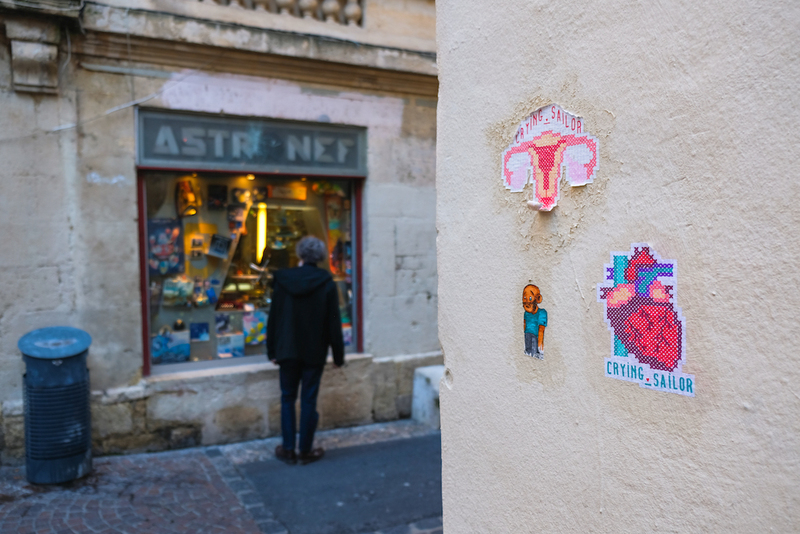 Montpellier’s vivid street art scene embodies the cool-and-creative vibe that makes this such a great city. Local highlights include a large number of pixellated space monsters created by French street artist Space Invader. If you trace the locations of all the aliens in Montpellier on a map, you may notice that it forms the outline of a space monster. Lunch is France, as we all know, is the most important meal of the day. It’s also one of the most affordable ways to eat well, with set menus available from around €15 with a drink included. Keep an eye out for the big A-frame blackboards and posters that restaurants place out front as these will display their daily ‘prix fixe’ (fixed price) or ‘formule’ lunch offering. These typically include a starter and a main dish, as well as bread and a drink. Sometimes you can choose a dessert instead of a starter. 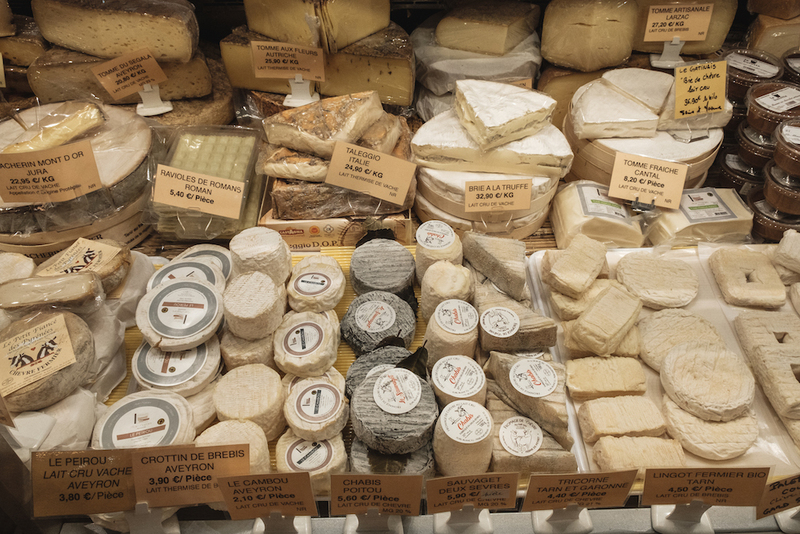 An authentic insight into local life, Montpellier’s market is the place to shop for fresh fish and shellfish from the nearby ports of Sète and Agde, as well as wine from the nearby Languedoc region and piles upon piles of stinky French cheese. 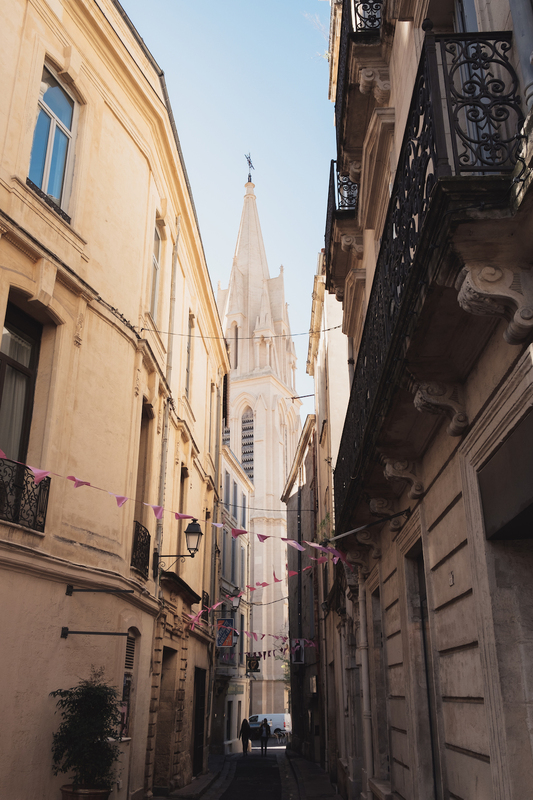 Montpellier is the administrative capital of France’s famous Languedoc-Roussillon wine region, which produces around a third of the country’s wine (that’s a lot of wine). 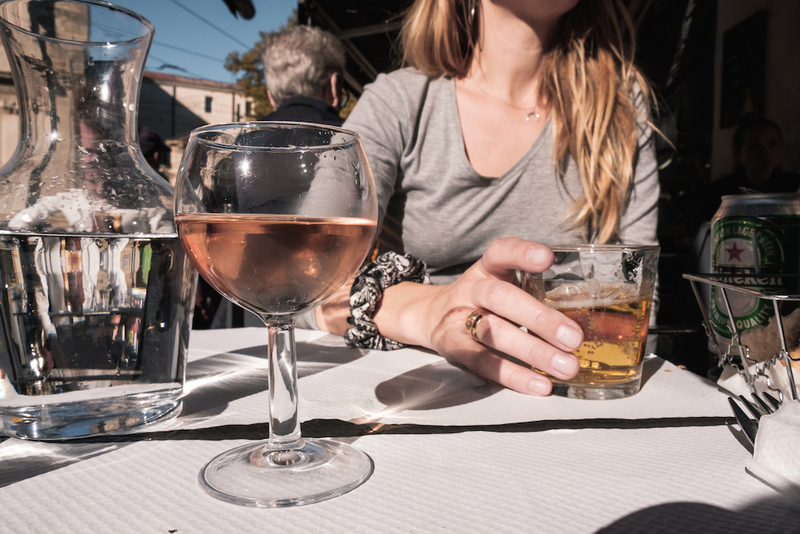 What wines to drink in Montpellier: In a nutshell, all of them. But one thing I did notice when asking for recommendations was that I was always invited to try a local rosé. This is no doubt due to the city’s proximity to Pic Saint-Loup, a sub-appellation of the Languedoc appellation, which exclusively produces red and rosé wines. Also be sure to try the dry and citrusy Picpoul de Pinet AOC wines, which are perfect for pairing with fish and seafood. Tip: If wine and food’s your thing and you have time then definitely try to do this wine and oyster tasting tour of the Thau lagoon and vineyards of Picpoul de Pinet and Grès de Montpellier. 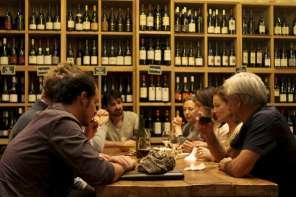 I also like the sound of this wine tasting tour which visits two Languedoc château wine estates. I must confess I’m not much of fashionista. Frankly, I hate shopping. But I’d be remiss not to mention that Montpellier is something of a fashion capital. 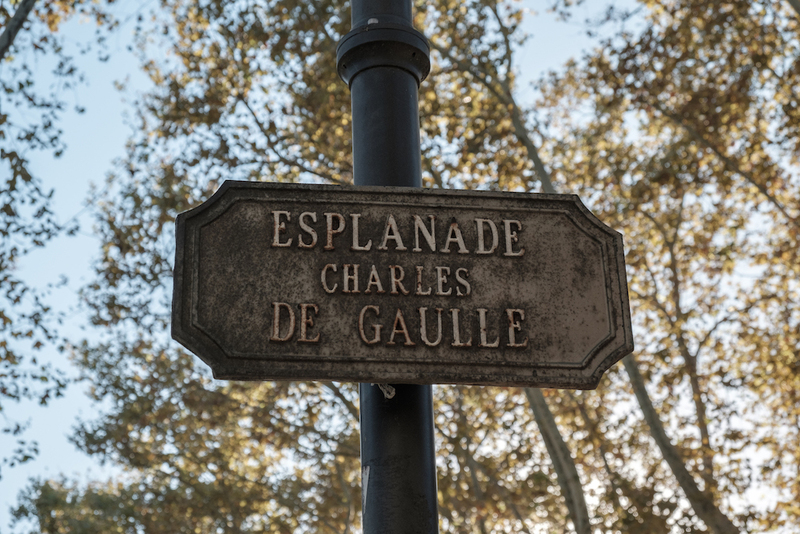 To get started, simply head to the city’s ultra-trendy Rue de la Loge and Boulevard du Jeu de Paume, as well as the many little lanes that splinter off it. The moment you’ve all been waiting for… Nothing can transport you back to La Belle Époque quite like a little boozy apéritif to mark the end of your day and the beginning of your night. You can drink whatever you like, but to do it like the locals I’d suggest trying Campari, a ruby-hued drink that tastes like bitter orange peel and wild herb. If Campari is a little too punchy for your taste buds then try an Apérol instead, which is similar but sweeter, lighter and generally more refreshing. And of course, no trip to the south of France would be complete with tipping back a few fortifying glasses of local pastis, an anise-flavoured spirit that the French go crazy for. Where? Everywhere and anywhere that tickles your fancy. We found ourselves on the terrace of Café de la Mer quite a lot because it was close to where we were staying. And there are many great options to choose from in Place Castellane. Tip: Many bars have happy hours so keep an eye out for A-frames and posters shouting about boozy bargains. 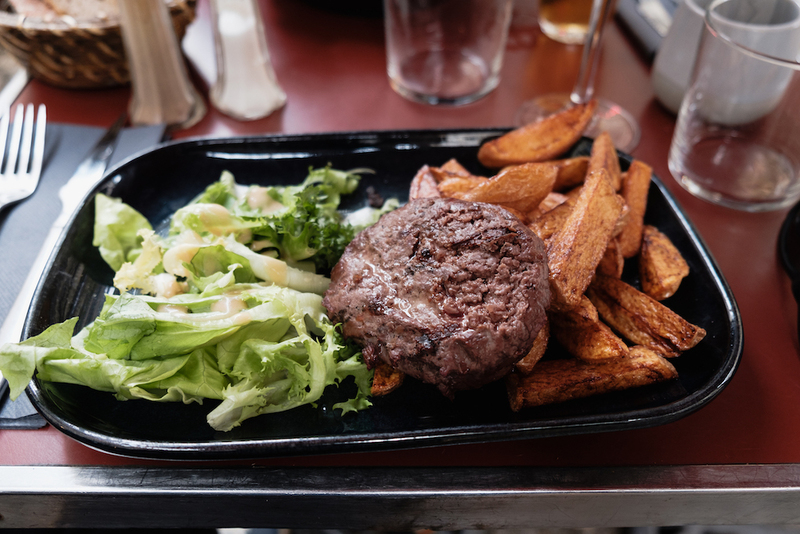 Le Petit Jardin – Something of a local institution, this 50-year-old bistro and restaurant is one of those places where you’re guaranteed a good meal. Pastis – One of the best high-end restaurants in Montpellier. Treat yourself to one of the food and wine tasting menus to see what all the fuss is about. 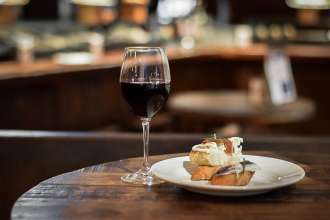 Bistrot d’Alco – A tiny little local spot with simple but good quality dishes and wines at reasonable prices. I had too much rosé here are starting singing happy birthday to the table next to us. 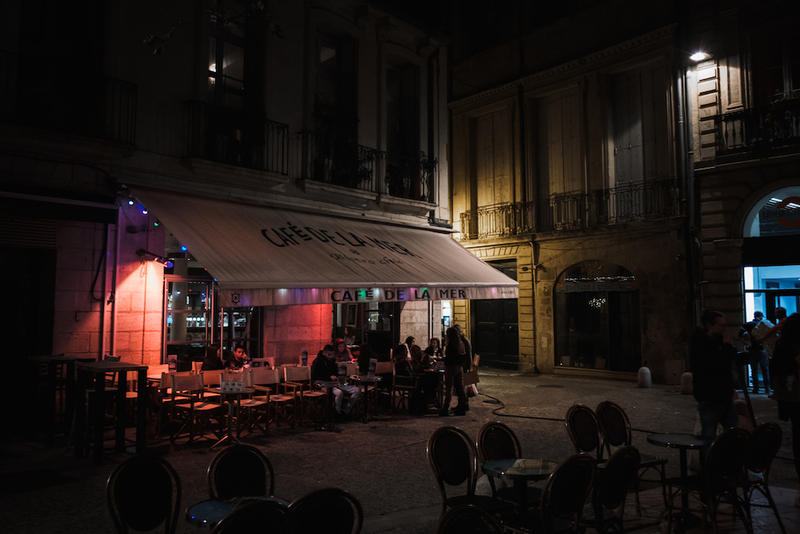 With its thriving student population, it’s no surprise that Montpellier is a great place to go out at night. We literally followed the crowds to the busy Rue de l’université and ended up in a seriously cool bar called La Chat Noir. La Fabrik is another trendy hotspot. 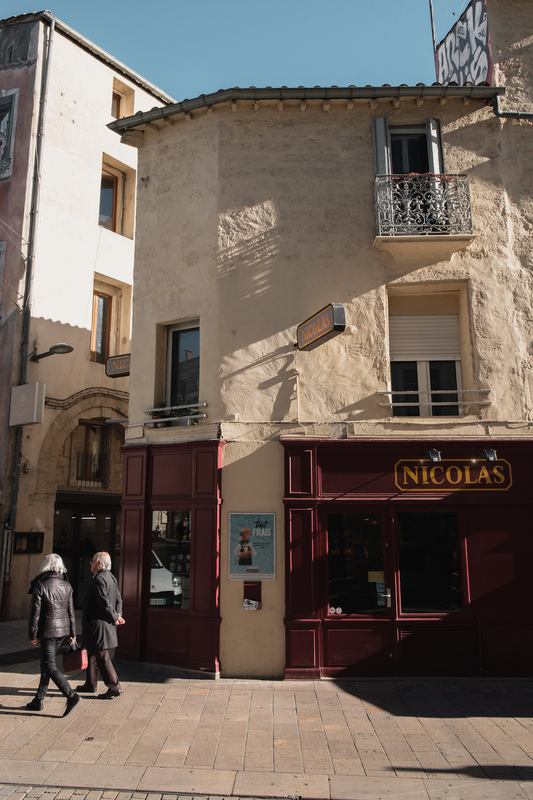 For your craft beer fix in Montpellier, head to bars like Hopulus Brewpub, The Black SheepandBear’s House. 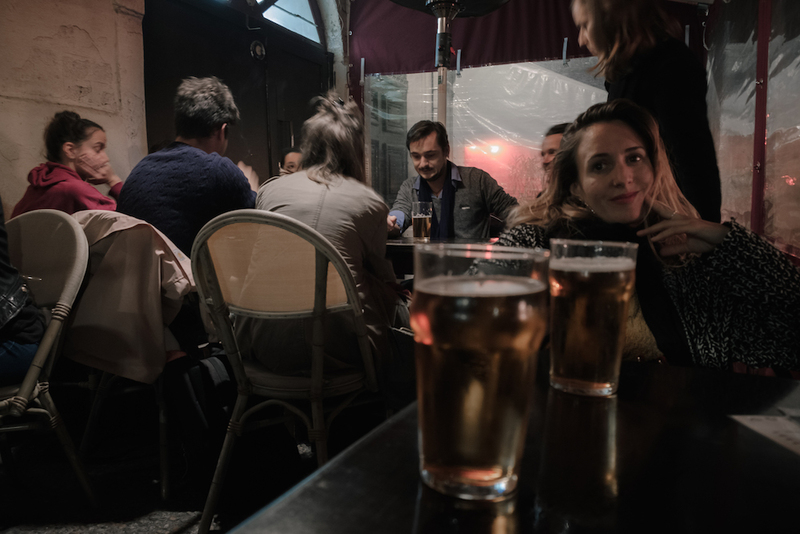 Other lively areas with great bars in Montpellier include Quartier Saint-Roch, with Saint-Roch Square and Saint-Côme Square bother bing popular meeting points. Rockstore, Fitzpatrick’s Irish Pub and The Shakespeare are known for their international crowds and nightly live music shows. Absolutely. 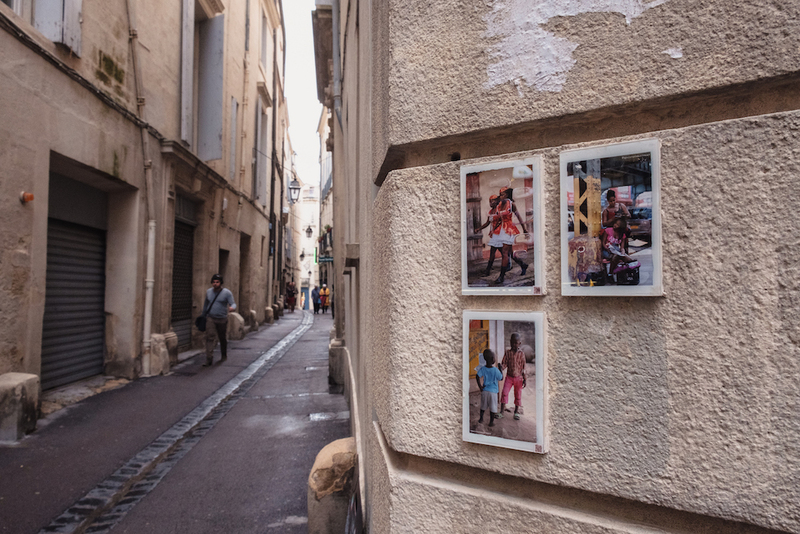 Montpellier is one of those idyllic French cities that will charm the pants off any traveller in search of the joie de vivre. It’s refined and elegant, but with enough of an artsy edge to keep things interesting and exciting. 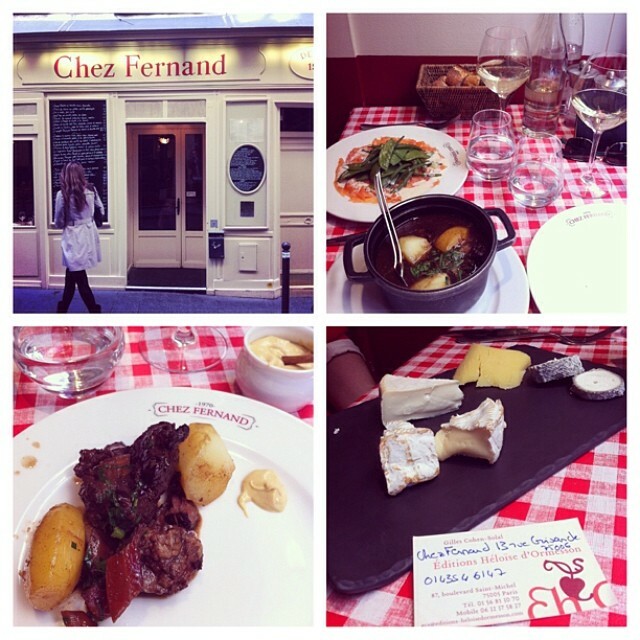 In many ways it offers the best bits of Paris, but in a more manageable and affordable package. A must for all Francophiles. 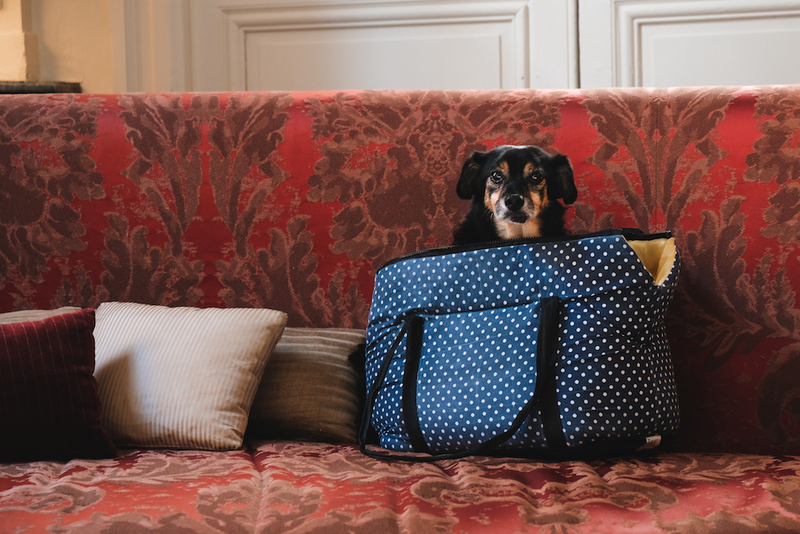 We stayed at the spectacularly romantic Baudon de Mauny boutique hotel and I honestly can’t think of a better place to stay in Montpellier, especially if you’re only in town for 2 or 3 nights. 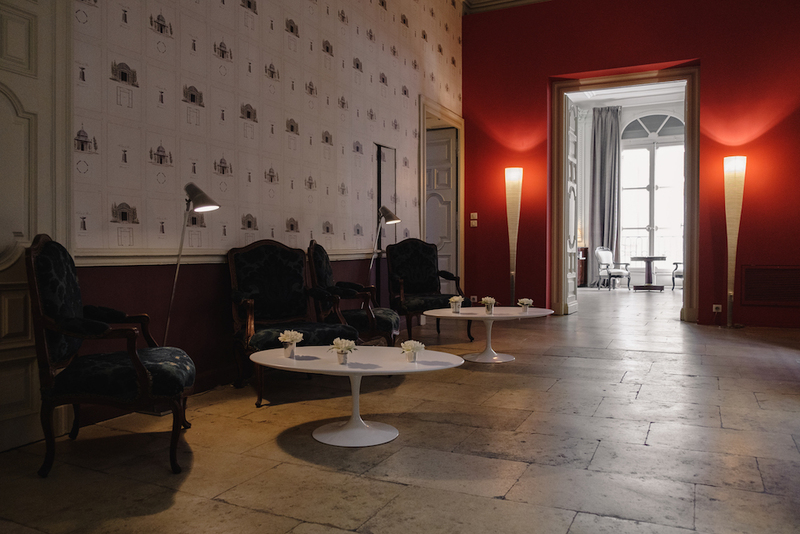 This heritage hotel is housed within one of the best preserved hôtel particuliers in Montpellier and boasts a prime location right in the heart of the Écusson old town. I must praise owners Alain and Nathalie de Bordas for doing such an incredible job with transforming this historic private residence into a truly unique boutique hotel. 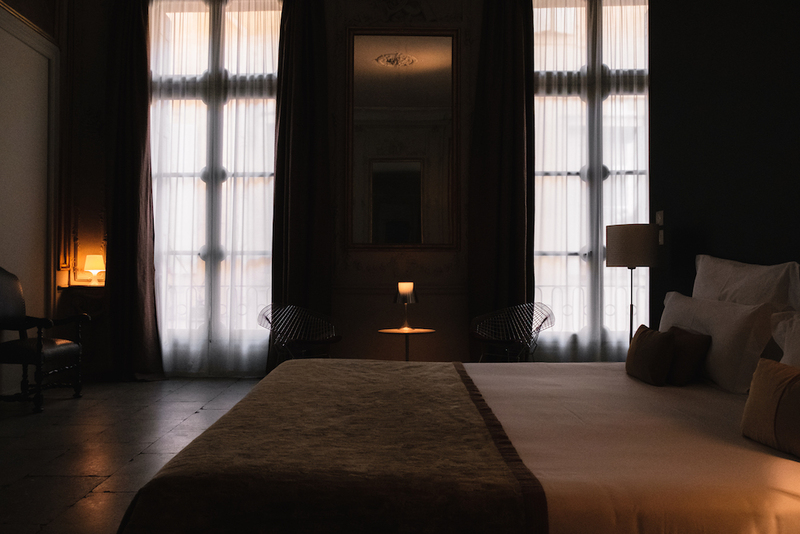 Each of the ten bedrooms and living areas boast original features – time worn stone and marble, storied gold leaf and stucco – paired with carefully chosen pieces of contemporary furnishings. 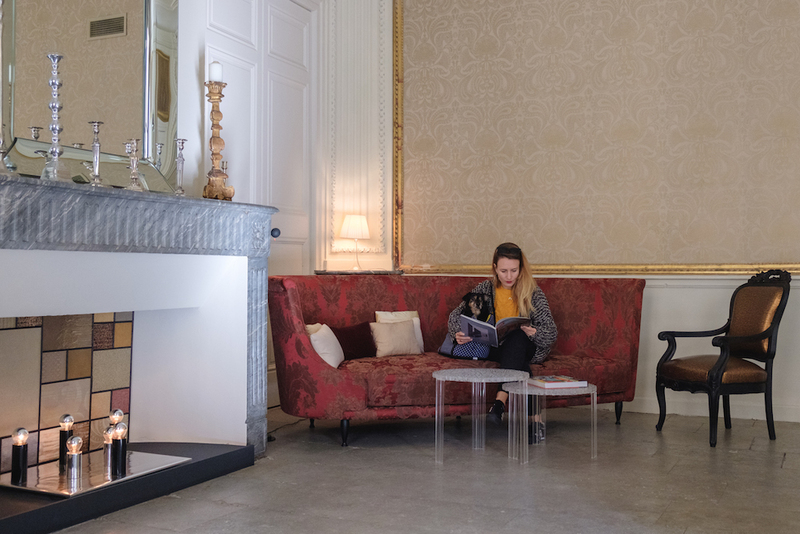 Relax in the sunny living room with a glass of something special from the honesty bar and let yourself be transported back in time to the glory days of the haute bourgeoisie. 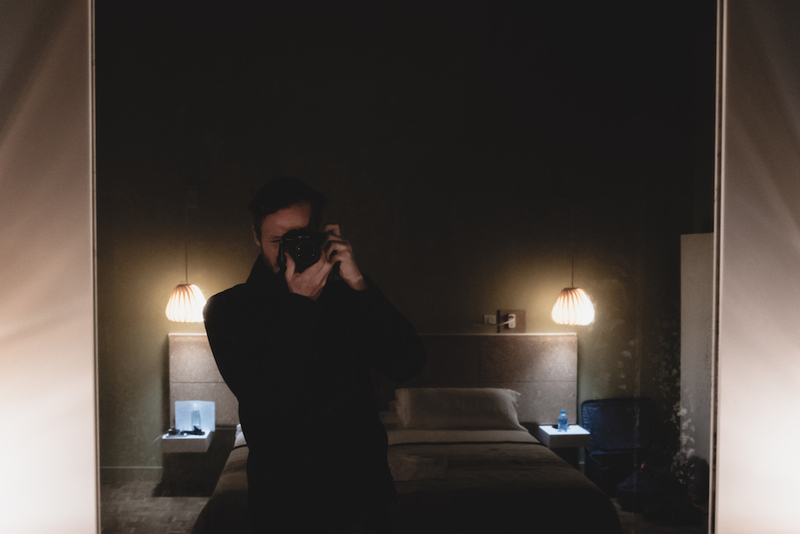 This really was one of the most special hotels we’ve ever stayed at. 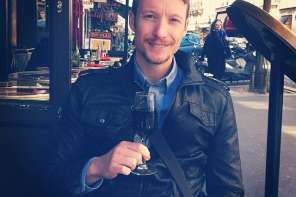 By train: In my personal experience, Montpellier is the perfect city to visit by train – especially if you’d like to do a bit of a tour and explore other destinations in France and/or Spain. 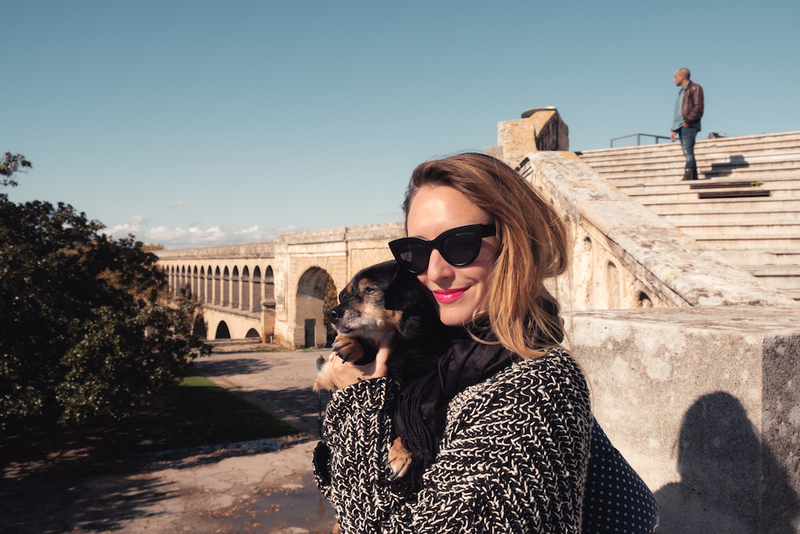 We hopped on the RENFE SNCF train in Barcelona with our little doggy and were in the centre of Montpellier in less than 3 hours. 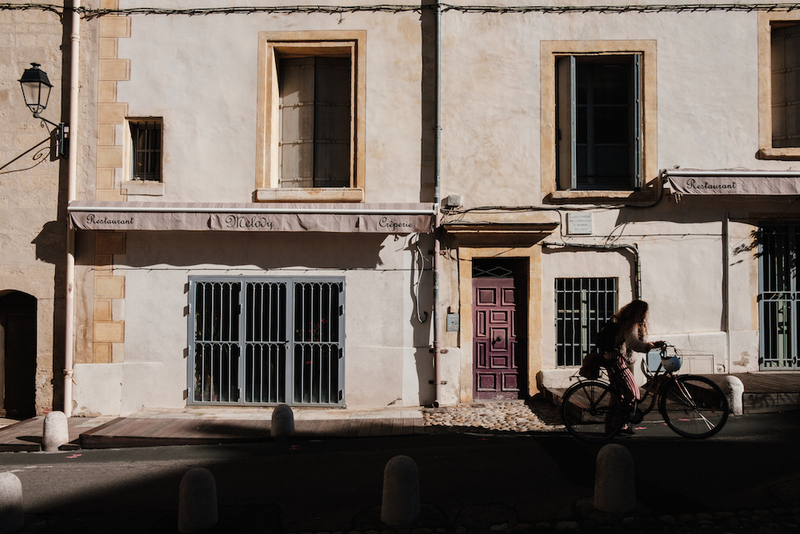 By plane: Montpellier isn’t necessarily the best French city to fly to. The nearest airports are Nimes airport (40km away), Beziers airport (57km away) and Avignon airport (82km away). I’d probably be inclined to fly into somewhere like Paris, Lyon on Marseille and riding the train from there, stopping off for a night or two at different towns along the way. By car: Home to dazzling cities like Avignon, Aix-en-Provence, Cannes, Monaco and St. Tropez, not to mention the blissful Côte d’Azur, the south of France is paradise for road-trippers. 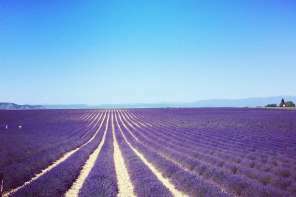 See my post about my “Roaring Road Trip Through Provence and the French Riviera” for inspiration (although you may want to do it a slightly more comfortable way). 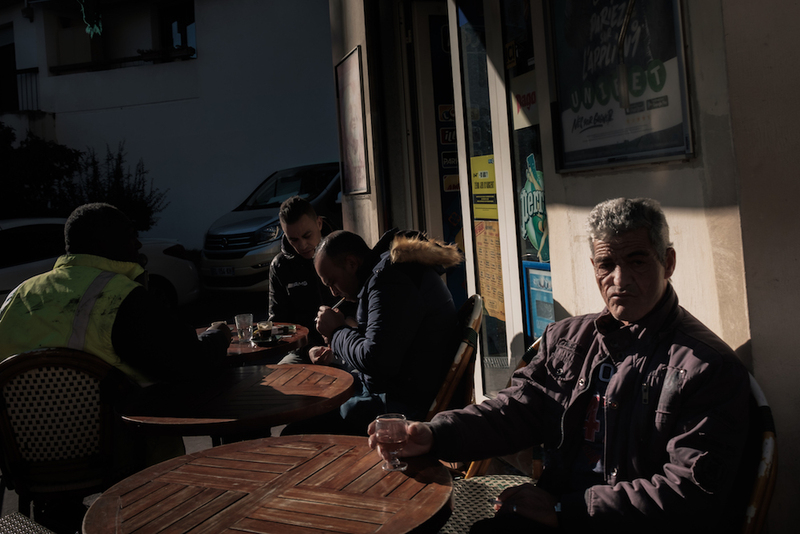 We went to Montpellier in November and enjoyed one full day of sunshine and another of showers. 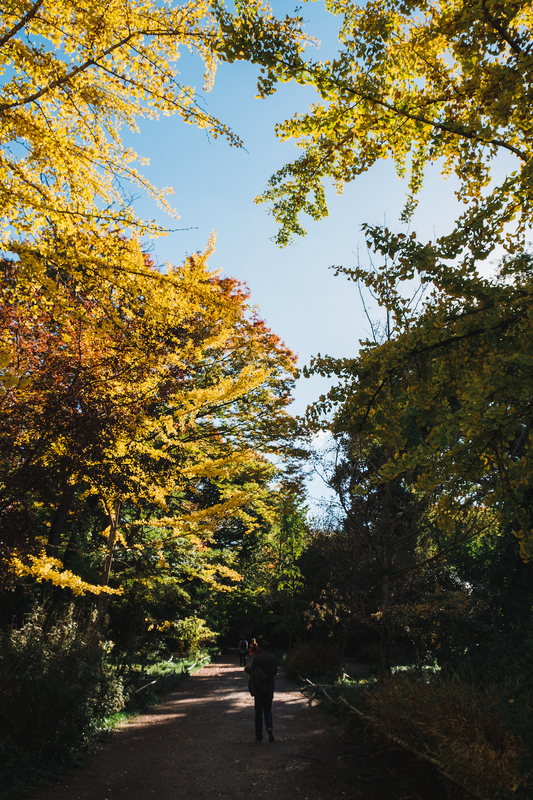 I’d recommend visiting any time in autumn (September to November) or spring (March to May) if you want better travel deals and to avoid the crowds and blistering temperatures that southern France is known for in the summer. 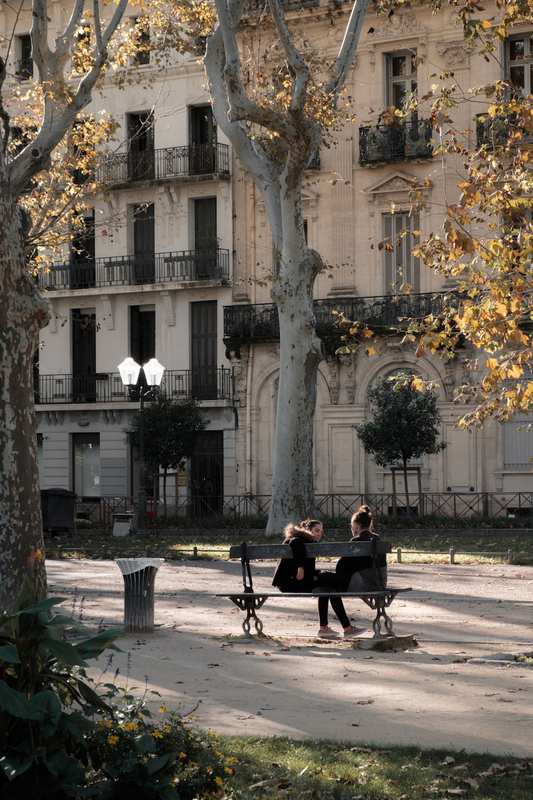 I’m sure you’re going to fall in love with Montpellier like we did. 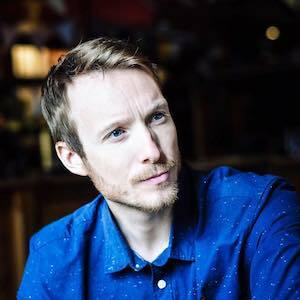 I’d love to hear about your experience so please do join me on Instagram / Facebook / Twitter / Pinterest / YouTube to let me know!